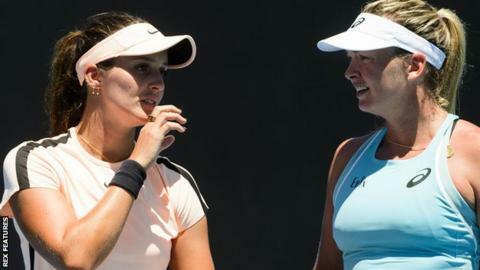 Laura Robson and Coco Vandeweghe were knocked out of the Australian Open women's doubles in the first round by Hao-Ching Chan and Katarina Srebotnik. Briton Robson and American Vandeweghe lost 7-6 (7-3) 6-4 to the Taiwanese-Slovenian pair. British pair Naomi Broady and Anna Smith also lost - 6-2 6-1 to Czechs Lucie Safarova and Barbora Strycova. Robson, at 227 in the world, was not ranked high enough to enter qualifying for the singles at Melbourne Park. Following her defeat, Robson spoke for the first time about being at a music festival in Las Vegas in October, when a mass shooting left 58 people dead. "It was a crazy, crazy thing to happen and I got really, really lucky," said Robson, who initially did not realise what was happening. "My friends got really, really lucky. I don't really like to think about it. "I thought it was something on the stage. My friend, one of the girls I was with, she is from North Carolina so she was the first one to be like, 'hang on here, that is definitely bullets'." On the tennis court, the 23-year-old has reunited with Dutch coach Martijn Bok, who guided her to the Wimbledon junior title in 2008. Robson was ranked in the world's top 30 as a teenager, but fell down the rankings because of long-term wrist problems that required surgery. Asked if retirement entered her mind while she struggled to improve her ranking last year, she told BBC Sport: "When you're a couple of weeks into a trip by yourself in China, it definitely does enter your thoughts. "When I started to feel that way I just had to change my mindset and change the people I had around me a little bit. I got my old coach back and we had some great weeks at the end of the year, training really hard, and he's here with me now and I feel a lot better." Robson, who turns 24 on Sunday, added: "I actually feel good. I feel very happy on court for the first time in a long time. "My goal for the end of the year is to be back in the top 100 but really, for me, I want to feel the best possible version of myself again on court. "That's something that's just not been there the last few years."